Look at this neat knife-board combination! Every kitchen needs sharp knives and cutting boards. The Santoku Knife with Ginsu Cutting Board set is special. Chikara blades are noted for being stain and rust resistant, strong, and sharp edged. Forged from Japanese stainless steel, this 7-inch cutlery has a heat and water resistant resin handle that fits easily in your hand. The attractive bamboo cutting board has a groove to help contain meat juices, an open slot handle for easy lifting, and a magnetic slot to safely and securely hold the knife. A perfect item for your food preparation arsenal and a perfect gift to give for weddings, showers, birthdays, and housewarmings. Chikara Series knife blade Is noted for stain and rust resistance, strength, and ability to hold a very sharp edge. Traditional Japanese style handle Is heat and water resistant resin that will fit easily into your hand. Japanese steel tang in handle Extends completely through the length of the handle for a durable grip. 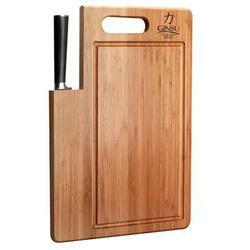 Bamboo carving board Is made from a renewable wood source and offers an open slot handle for easy lifting. Magnetic knife slot is built-in to securely hold the knife in place for storage.